Dads, Sons and Competition | Breezy Mama Breezy Mama - Expert parenting advice, celebrity interviews, product reviews for kids, moms and babies and more! We’ve all seen it–what started as a little friendly competition between elementary aged boys turns into a full scale war and ends with tears–lots of them. This is an age where it’s hard to teach the fact that “we’re just having fun”, that life is not always about winning; one must enjoy the ride. 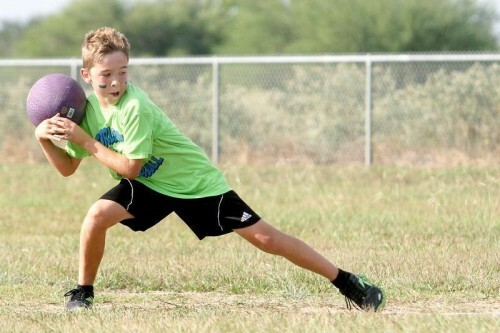 This article came about because a dad wrote in to Breezy Mama--he was organizing a “friendly” kick ball tournament, and instead of enjoying the game, his 8-year-old son was out to WIN, and when things didn’t go that way, he lost it. How, the dad wondered, do we handle this? How do we teach our boys that’s about effort and good attitude? Breezy Mama turned to Dr. Ronald Levant, a professor of psychology at The University of Akron and the nation’s top expert on the psychology of men, for some answers. How do I let my son know that I’m (dad) not disappointed when he’s not getting first place? Convey to your son that sports are not just about winning and losing, but about how you played the game. I think the best way to do this is by being a good role model. That is, as a dad you should value sports for more than just the winning and losing aspect. You should value it for the camaraderie, for doing one’s best, for watching other people do their best, and for the general enjoyment of a nice active day, etc. Then, you should act in accordance with your values (as we all try to do). Your son will pick up on your attitudes and behaviors, and develop his own as a result of the example you set. How do I teach him not to worry about winning or failing, but just having fun? If you, as a father, participate in sports for example, you can demonstrate that you enjoyed yourself even if your team lost, or even if you didn’t play well, because you were able to get together with your friends and enjoy a nice day outside. Or if you watch sporting events, invite your son to watch with you, and focus on the positive aspects of the time spent together watching the game. At this age (8), boys are just starting to learn about losing. Up until this point (with organized athletics), score hasn’t been kept, there are no winners, etc. As a result, it’s tough for them to learn how to lose. How do I react to my child who is disappointed that he has lost? Again, being a good role model is the key. Point out that losing was not the end of the world, and don’t become overly dramatic and dwell on your own losses (or your favorite sports team’s losses). Lend an ear after your son loses a game, and allow him to express how he felt and behaved when his team lost. It is natural to be somewhat sad after a loss, so don’t deny your son the opportunity to appropriately express his emotions. I want to stress his effort, and the fact that he tried his best–how do I teach that? Recognizing effort definitely dulls the sting of a tough loss, so offer your son genuine, specific compliments. Focus on what he did well and how he helped his team excel. With athletics, should I give advice on how to be better, or just let the coach do the job? When do I give advice? Coaching situations vary vastly, so I’m afraid I don’t have a universal answer for this question. In general, showing respect for a coach and deferring to his or her authority sets a good example, but there are exceptions, as not all coaches act in a manner that is worthy of such respect. And, a bit off topic, but what are the inherent differences between a father/son relationship, compared to a father/daughter relationship? In respect to sports, this is an area where there used to be big differences in how fathers related to sons and daughters, who were reared on separate gender tracks, before the modern feminist movement reshaped our culture’s understanding of gender and the family. This began to noticeably change in the mid-1980s. Also after Title IX, girls’ participation in sports has really taken hold in a big way, and the issues girls and boys face in the sports arena are not very different. More to the point, the issues that dads face in parenting sons and daughters – in terms of sports – are very similar today. Ronald F. Levant holds a B.A. in psychology (honors with great distinction) from the University of California, Berkeley; an Ed.D. in clinical psychology and public practice from Harvard University; and an M.B.A. in general management (high honors) from Boston University. Foremost authority on the psychology of men and masculinity, Dr. Levant conducts research on men’s gender role strain, emotional expression, mental and physical health, fathering, and masculinity ideology in a multicultural perspective. He has authored and co-authored, edited or co-edited over 300 publications, including 14 books, over 200 refereed journal articles, book chapters, and numerous newsletter columns. His most recent book is: Norcross, J. C., Beutler, L. E., & Levant, R. F. (eds.) (2005). Evidence based practice in mental health: Debate and dialogue on the fundamental questions. Washington, DC: American Psychological Association. Fellow and 2005 president of the American Psychological Association, Dr. Levant has served as president of its Division 43 (Family Psychology) and co-founder/first president of Division 51 (Society for the Psychological Study of Men and Masculinity). He is also a licensed psychologist (OH, MA), and diplomate of the American Board of Professional Psychology (clinical and family psychology). His numerous awards include the 2010 American Psychological Association Award for Distinguished Contributions to Applied Research, 2002 Harold Hildreth Award (Division 18, Psychologists in Public Service), and 1995 Ezra Saul Psychological Service Award (Massachusetts Psychological Association).